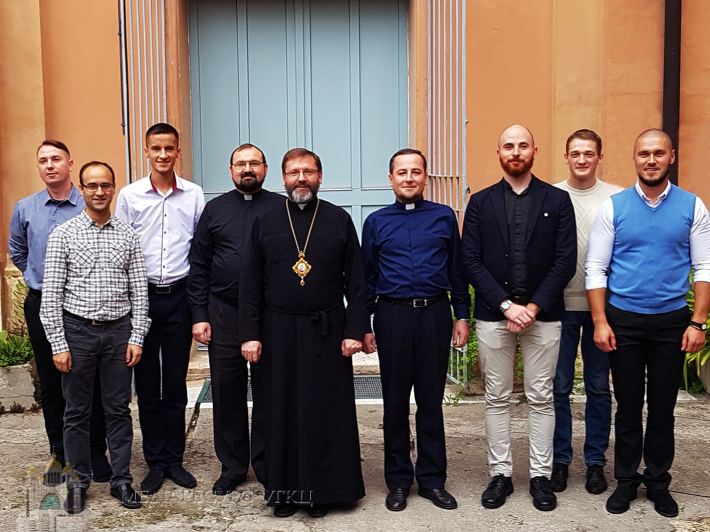 On Monday, October 22 His Beatitude Sviatoslav visited students from Ukraine who live and study in Pontifical Greek college in Rome. During the conversation Head of UGCC asked about their studying and emphasized the importance of spiritual and intellectual formation of seminarians and priests throughout their pastoral service in UGCC. They also discussed an intention to commemorate blessed holy martyrs, former students of Greek college in order to worship and popularize their hermitry in times of UGCC persecution. In addition, meeting of His Beatitude Sviatosalv and Ukrainian students of Pontifical Greek College is viewed as a matter of concern of UGCC to education of contemporary and future priests. Previously, Head of UGCC had met with students of Ukrainian pontifical college of St. Josaphat.